What can we – students, activists, artists, readers and citizens of cities – do to stop gentrification? It seems that students moving to cities are both victims as well as culprits of gentrification: students come in with little money, they graduate, perhaps they settle down with a good education and with their disposable income change neighborhoods and make them less affordable. Certainly, students and “hipsters” seem like two overlapping identities at times. But another demographic seems not as innocent in their impact either: artists. The hipster is an odd figure. On the one hand, being cool and hip is not desirable for the hipster. Listening to Top 40 music is out, as is wearing and using high-class, high-profile fashion, accessories, gadgets and so on – everything must be second-hand (or at least look like it). It seems that the hipster’s aesthetic-political goal is to subvert a classical cultural orthodoxy – to look poor rather than exclusive and rich (while not necessarily being poor). On the other hand, a hipster is precisely what they are trying not to be: hip. Thrift stores are as popular as ever, ripped jeans and bleak shirts are present on all storefronts and the older the technology used to listen to music, the more cool one seems. Sarah Thornton, sociologist and author of the book Club Cultures (1995), encapsulates justly the paradoxical position of being a hipster with the term subcultural capital. Subcultural capital becomes important for hipsters to distinguish themselves through their knowledge of the subcultures not many have knowledge of. This has sociopolitical implications, as the case of a graffiti wall titled The Death of the Neighborhood shows. The French artist and author of this work, MTO, describes his work as a critique on “hipster shits, business craps and all the center of gentrification activities” (qtd in StreetArtNews, 2014). Indeed, for MTO and many others the hipster is a symbol of gentrification. Taking the aesthetics of the working class and making them hip seems to be the driving force behind this process. I think it is fair now to speculate a bit. Graffiti, for most of its history, has been perceived as “dirty” art – as not worthy of being in a museum or really talked about or perhaps even not considered art as such. But with prominent artists, such as Banksy, this art form has gained quite some recognition. Their subcultural capital may perhaps have become not so sub at all! So, what I would like to speculate here, is that graffiti and the hipster are not so different in their sociopolitical impact at all. Frederic Jameson (1991) argues that under post-modernism and late capitalism cultural logics shift from production to consumption. The post-industrial society is, by and large, a consumer society. Naturally, the consumed goods are produced somewhere, but that is truly not the main place at which capital is moved. So, too, can the reception of graffiti be understood. Production of meaning is perhaps fleeting. It may occur for a short period of time – the real value of graffiti, however, lies in its consumption. The Death of the Neighborhood thus may provide value for consumption, for aesthetic pleasure, for hipsters to ironically stand in front of it with a cup of starbucks. Its meaning is less important than its aesthetic consumerability. Perhaps this is where Critical Making, a concept described by Garnet Hertz (2018), comes in as a solution. Critical making is not so focused on creating objects that spark discussions and critical engagement – this seems somewhat impossible under post-modernism. Instead, it’s focused on the process of making. Meaning making then occurs not in the product or in the post-production but in the pre-production. The process of engaging with matter critically is where its value is at. Maybe that’s what we need more of: local people making graffiti and\ reclaiming thereby their right to the city. Maybe then the people involved have a chance to think critically about what they want their city to be. And maybe that’s ultimately more critical than a well-executed but very consumable artwork by a world-known graffiti artist. Hertz, Garnet. 2018. “What is Critical Making?” in Current. http://current.ecuad.ca/what-is-critical-making. Last accessed: 05-03-2019. Jameson, Fredric. 1991. Postmodernism, or, The Cultural Logic of Late Capitalism. London: Verso. Levy, Rom. 2014. 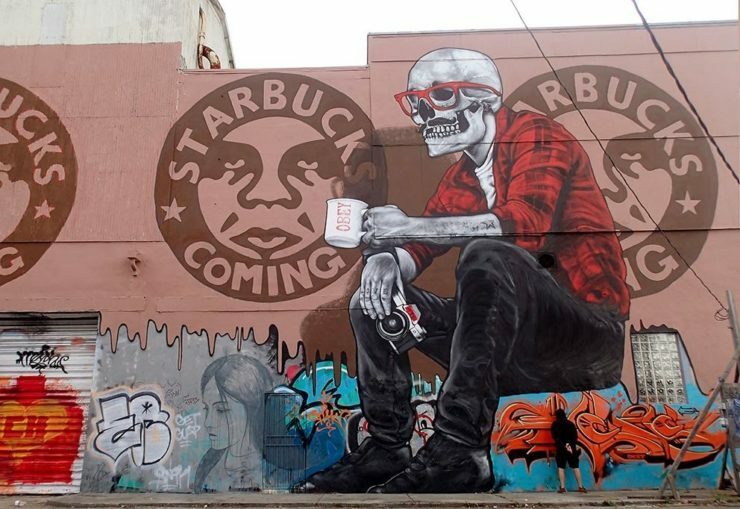 “MTO paints “The Death Of The Neighborhood” in Wynwood, Miami” in StreetArtNews.net. https://streetartnews.net/2014/12/mto-paints-death-of-neighborhood-in.html. Last accessed: 05-03-2019.